One of the things that makes writing about private higher education difficult is that most media coverage goes for the extravagant story without providing proper context. Often this takes the form of cherry-picking some reality from an Ivy League school and presuming that it is representative of all colleges. Other times it comes from looking at aggregate data without carefully deconstructing what that data is telling us. Ms. Yellen’s words were a useful corrective to the view, expressed at great but tendentious length by presidential candidates this year, that student loans are “crushing” America’s young people — and that a major federal initiative is needed to correct that. In fact, debt distress is disproportionately concentrated in certain segments of the market, including professional schools and for-profit four-year colleges. That’s a nice line, but the professional media has certainly contributed its share of debt-crushing stories with titles of “Is College Worth It?” Still, I’m pleased that the Post paid attention to what Ms. Yellen had to say. 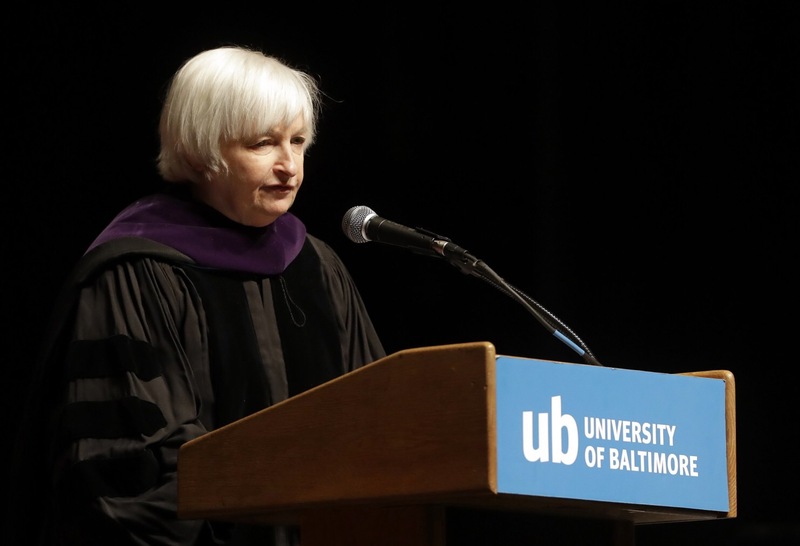 In her speech, Yellen made clear that earnings for college graduates now outstrip those of people with a high school degree by 70% today compared to 20% 35 years ago. To be sure, much of this is due to the ways our economic transformations have disproportionately harmed high school graduates or those with some college. According to the the recent national data, the total amount of student debt has reached $1.25 trillion. On the other hand, the median monthly payment for recent college students (aged 20-30) is just over $200 a month. So where does the big debt come from? As Ms. Yellen points out, 40% of student debt is incurred in graduate or professional degrees. Other data sources put another 18% of the debt at the doorstep of for-profit colleges. Both of these institutional forms do not provide institutional aid (tuition discounts) and often require borrowing to support living expenses as well. The students who are maximum risk of being burdened by college debt are those who take out maximum loans while not making adequate progress toward graduation. In that case, one gets the debt burden without the increased earning power. In discussing higher education, you may have noticed that I have spoken in terms of completing your degrees. Research shows that a large share of the benefits I have described from higher education comes only to those who graduate. Even those completing three or more years of college benefit much less when they don’t get a degree. For example, some of you may be worried about paying off loans you have taken out to pay for your education. The good news is that the vast majority of student borrowers who complete their degrees find work that allows them to keep up with their payments and pay off their loans. What does all this mean? For students, it means that borrowing for a meaningful education will pay dividends in the long run — even in art history! It means that key to success is a careful academic plan that gets on finished close to on-time. Private liberal arts institutions have a higher rate of on-time completion than other institutional types. For institutions, it mean that we need to be honest about the real costs and benefits of our degrees. We need to make sure that our students are progressing toward degrees and not simply enjoying the college life. One of the few points of agreement between President Obama and President-Elect Trump involves the favorability of income based loan repayment plans with the possibility of forgiveness down the road. It’s an important policy initiative because the patterns for high school earnings are not likely to improve in coming decades. It’s the kind of policy that provides incentives for people to adjust to the economic transformations that have taken place. It’s certainly not the time to think about attacking student borrowing as the new chair of the House Education Committee, Virginia Foxx recently suggested. I’ve spent a lot of time since the election pondering what it would have take for policy makers to incentivize those left behind by economic transformation in the same way they incentivized new business development.